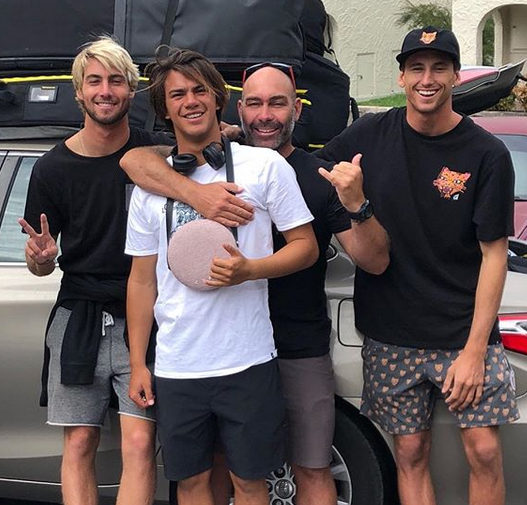 We we lucky to host surfing coach @llewllynshittaker along with his team of Pro Surfers Leon Glatzer @leonglatzersurf http://www.worldsurfleague.com/athletes/4271/leon-glatzer , @ethanfletcher and @dylangroen into the 3P household this past week. Llewellyn and I met many years ago whilst we were competing on the WQS. We’ve loved reminiscing about old times, sharing with the next gen of surfers how tough we had it, no mobiles, GPS or internet to navigate around the world. It was awesome to catch up on our competitive surfing years. 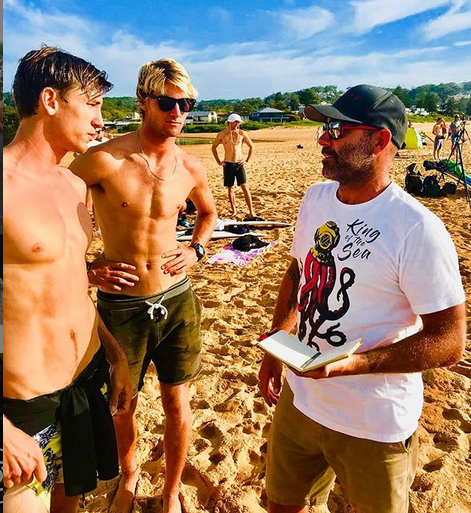 Great to see how serious theses guys take their surfing profession, always learning tactics and techniques from their highly dedicated and motivated coach. We are certainly looking forward to watching you guys rip it up around the globe and prepare for Japans upcoming Olympics. Thanks for sharing your infectious stoke of surf with us this week and for looking after the kids so well!! Your families would be proud of the men you are becoming. See you next time around guys! Boomerang you were awesome. Avoca here comes the A team hot and ready. What a great way to test out our newest board model the 24/7. This all round short board is ideal for 1 foot beach breaks to 6 foot reefs…hence the name AND boy can I say it performed during a weekend of pumping waves for the HIF NSW Surfmasters competition. Stoked to say I’ve gained a spot in the upcoming Australian surf masters titles in Coffs Harbour in a few months. A title I’d love to win again!! Head on over to NSW Surfing Instgram from today to see it in action. Thanks to HIF, the event organisers and competitors for a great weekend. 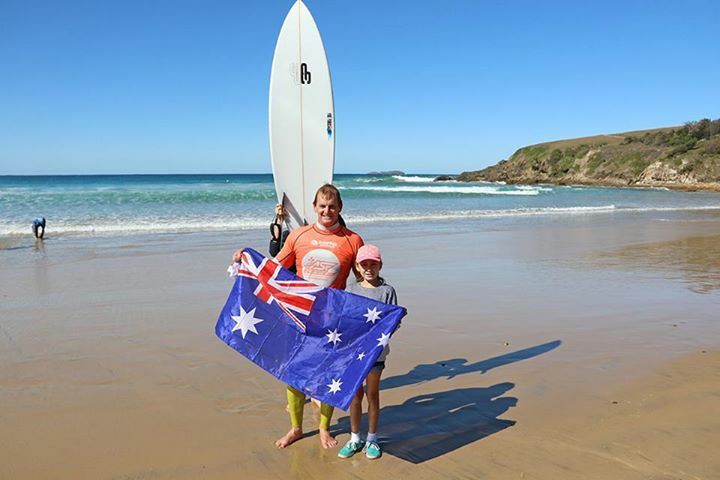 To check more of the surfing from the weekend head on over to Surfing NSW Instagram feed. Surf Commentator Tezza McKennas take on 3P..
Like a fine red wine some things just get better with age and Parksey (as he is known to his mates) is a great example of this principle. As a junior competitor Paul showed good potential but never had the results that he wanted. But in typical 3P fashion, he knuckled down and trained longer and harder then most of his adversaries and came out of the blocks in the open division as a completely remodeled individual. He powered through the amateur scene at breakneck speed and jumped straight onto the WQS where he immediately rattled cages. Attention to detail & focus on excellence has long been a trademark of his surfing and more recently this principle transferred to his shaping. Paul is a perfectionist and his boards now ride under the feet of many of Australia’s best surfers including Ryan Callinan, Jesse Adam and blah bla blah. In 2013 Paul won the Australian over 35 Men’s title riding one of his 4-Fin contraptions that left the opposition in his wake, drawing speedy powerful lines in the small clean conditions. A down to earth bloke that has managed to blend intense enthusiasm and passion with methodical trademanship and establish the 3P label as one of the big movers in the high performance surfboard market. 3P should stand for Performance, Precision and Pricepoint. Let Paul Parkes Productions take your surfing to the next level. and surfboard building and design. Another one of Daniel Joyces amazing board art of Bob McTavish, which HBB auctioned for $1600. who dug deep to raise money for the Pro Junior. your board soon. Thanks for having 3P Surfboards on board and we look forward to next year. Next 3Pis off with Philippa Anderson to the Quicky Pro on the Goldie, so check out our instgram for updates. The Simon Anderson Club of the year. @ the Surfing Australia Awards night held in Manly last week. Well done to 3P team riders Philippa Anderson and James McMorland for their Surfest results. Team rider James Mcmorland is competing at Maroubra Beach in the Pro Junior! James is surfing The Slice as his board of choice. Check out the blog for some photos and stay tuned for results.